I’m currently doing research for a lecture I’ll be doing in April at a local college. The topic for the 5-week session is on art exhibits that changed the world. That said, I’ve been doing a lot of research on the various intentions, contexts and ways of presenting art and artists in the past 200 years or so. Besides the international uber-super-duper-exhibits, I’ve noticed a sweet little trend in the recent past that does not get much notice, though has recently been featured as one of the community endeavors of the 2013 Carnegie International [which, by the way, debuted nine months after the very first Venice Biennale (1895)]. The trend is that of an art lending library – the idea of letting anyone from the community with a library card, or proof of residence be allowed to borrow artworks from a library of contemporary work. Living with art is entirely different than seeing it at a gallery, museum or artist studio. I’ve heard of collectors who have lent their artwork from their homes to museums for special exhibitions. When they see the exhibit they liken their artwork to a friend in jail – being forced in a context it’s not ready for, wasn’t intended for and/or doesn’t look right in. And yes, artwork over the couch is great!! Impressionists used to paint the walls of the galleries to feel more like a home in order to make people become more acquainted with the art, and buy it. Braddock Library, Braddock, Pennsylvania – In conjunction with the Carnegie International this year a small artist group with a mission to engage communities called Transformazium, facilitated an art lending library in the town of Braddock. Some artists participating in the Carnegie International have donated works, and other donations have been collected by the facilitators. Anyone in the town with a library card may borrow the works, just like they would a book, for three weeks. One of the founders of Transformazium, Ruthie Stringer, was inspired for this project by a similar art lending library in Shenectady, New York when she was growing up. Market Gallery, Glasgow, Scotland – This library was staged in the Spring of 2012 with Market Gallery, a project commissioned by the artists Zoe Walker and Neil Bromwich, and existed for a finite time in conjunction with the Glasgow International Festival of Visual Art. Like the others listed here, anyone was able to borrow artworks for a short window of time. Over 60 works of art were collected and housed within the 100-year old Mitchell Library, one of the largest lending libraries in Europe. An added bonus to this event was a graphic designer charted the artworks’ journeys throughout the city on an online live map. Looks like the Arts Council England just announced the award of £42,997 for this Art Lending Library to travel. Will keep this on the proverbial radar. Ottowa, Canada, Art Lending Library – The oldest on the list, founded in 1970, sadly was the first I found to announce its closure. For over 40 years this gallery allowed people to rent artworks from community artists for a small fee. They just closed down this year, their web site cited “volunteer fatigue” as the culprit. They are planning to reconsider opening during the Summer of 2014. Tenderloin Art Lending Library (TALL), San Francisco, CA – Situated within the area most associated with the homeless in San Francisco, this tiny project seems to have its heart in the place of homeless and the disadvantaged community. While the focus is on the Tenderloin neighborhood, they lend art to others as well. The TALL project received funding from Southern Exposure’s Alternative Exposure Grant program in 2010. West-Seattle Art Lending Library (ALL) – Debuted in 2008, you may borrow an original artwork for three to four months, and if there is damage to the work a fee of $100 is due. Per their web site there is a modest fee to join the library, any Seattle resident may participate, and they have “check out” days hosted throughout the year. 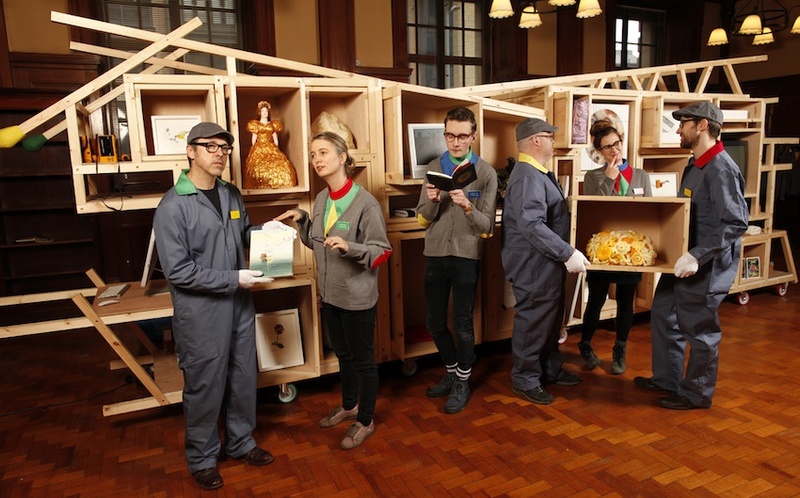 The librarians deliver the artworks to your home and pick them up. Since 2008 ALL has delivered hundreds of pieces of local artwork to Seattle residents, and has seen its art collection and patronage grow. The collection features work by local emerging and professional artists as well as the librarians.